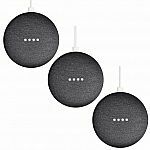 COSTCO has Google Home Mini Smart Speaker Powered by Google Assistant,, 3-pack for $74.95. Membership required. Shipping is free. (Start 8/20) Costco has Google Wifi 4pk AC1200 Dual-Band Home WiFi System for $279.99.